A new Pirate minion for Rogue has been unveiled. The reveal was made by BunnyHoppor. The video doesn't have sound for some reason, but it does have subtitles in English! This card has everyone perplexed, since it doesn't synergise with Captain Hooktusk - the Legendary champion - at all! Another matter to consider is how big you can make this minion go and if it is even worth it, since Rogue has pretty good removal options. Bloodsail Howler works better with Spirit of the Shark, although their combined mana costs are a bit high. Perhaps Pirate Rogue is going to be more midrange-y and less aggro than people would expect from a traditional Pirate deck. I am eager to here your opinion on this card! With the community reveals almost over, don't forget to check out our Rastakhan's Rumble hub and tune in at the official Hearthstone Twitch channel for tomorrow's final reveal stream. Hmm, it’s unlikely to be good on curve (maybe with swashburglar and patches in wild) but maybe that’s not too big an issue for rogue. Guess it depends how many pirates you can consistently get on board. A 2-mana 3/3 with rush is pretty good. Does synergise badly with hooktusk though yeah. I don’t see this making pirate rogue a thing on its own, but it could fit into it. But not convinced by pirate rogue yet. But the card alone is not enough to make pirate-rogue great. 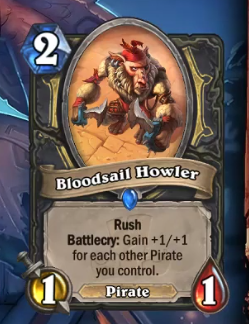 If pirate-rogue without this card would be good - this card will be included, 100%. If pirate-rogue without this card is not good enough, this card won't be enough to make it good. You don't want to pull this with legendary you want the pirates with 5 atk being pulled not a 1/1 so in any deck that runs the legendary pirate it cannot be included by any means. Ideally that deck fill the low mana spots with non pirates and plays only bigger pirates as pull target for the legendary like Kathrena Hunter that plays only big beasts and absolutely avoid weak ones in the deck. People look at this guys interaction with Captain the wrong way. If you have this in hand, and you play Captain, this is a 2 mana 5/5 rush, which is clearly strong. Its not like you will only play several pirates in that rogue deck.